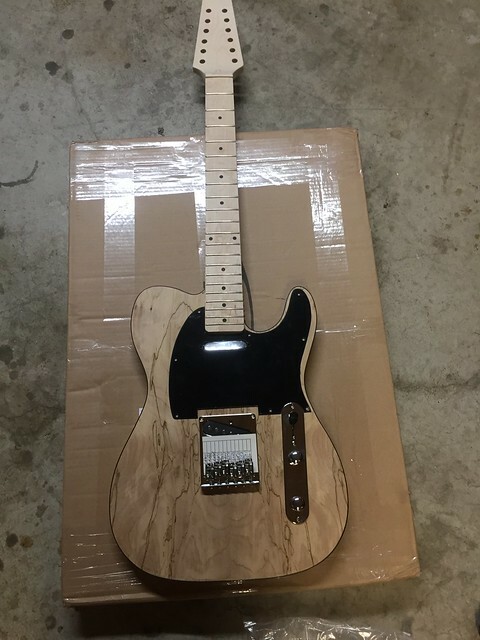 View Poll Results: Do I need a grain / sanding filler? They're here both kits but i will start with this the TL-12S. I have to admit i was expecting a lilt booklet with instructions, when i realised that ain't happening. I think I s--- my self. First thing first i need to set up a space to go back & forth from. oh boy! where to begin. Last edited by Benderson; 30-01-2019 at 04:10 PM. All instructions are on the website and in these forums. Mmmm, that’s awesome! Lovely pick mate, you may want to consider minimising the pick guard to highlight more of that spalty goodness! Carefully check drilling & routing relationship with the neck. I had to plug and move all up & left. Last edited by cork sniffer; 30-01-2019 at 04:38 PM. O, Oh think some poo just come out! No pick guard & what pick up is that?? I like.... is there a link on how to check all that?? yeah i like what cork sniffer has done!! Don't let it worry you, just take it one slow step at a time. Neck pickup is a Jazzmaster from Guitar Fetish. I'm sure others can direct you to a link showing exactly how to check neck to routing and how to correct any error. If I don't see any help by this time tomorrow I'll in my long-winded clumsy way tell how I did it. Last edited by cork sniffer; 30-01-2019 at 05:03 PM.